ECI has designed a wide range of tools and holders from many different turning arenas that are best suited for the "gang tool" style of machining. 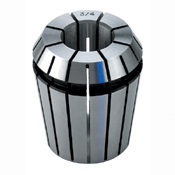 Smaller gang lathes such as the SNK Prodigy GT-27, CMS GT-Xcel, CMS GT-Xpress, Omni-Turn GT-75, or Haas OL-1 Office Lathe are all suited for either the 1/2" or 3/4" center height tooling holders. 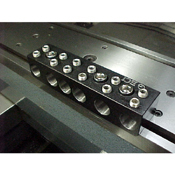 Gang lathes with larger spindle center heights - Hardinge GT27SP, Kia KIT-30, Hyundai HIT-400, or Daewoo/Puma 160, can add an appropriate riser blocks to incorporate ECI tool holders. Each tool has been selected to provide the best use of space without compromising the rigidity or functionality of the machine tool. All ECI tooling incorporate either a collet system, boring bar, or square tool to provide a rigid platform on which you can produce quality parts. 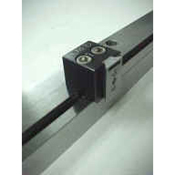 The tool holders can be used alone or in combination with other holders to best utilize the space on your tooling plate. Tool holder features include – Alloy bolts and nickel plated anchoring nuts, 3/8” half-dog alloy set screws for secure tool lock down, and thicker tool holders to provide long thread engagement on 3/4” bores. The multi-position holders, combined with storable and down-loadable tool offsets allows quick job change-overs, reducing set-up times.